1994: Did they even have the internet in those days? 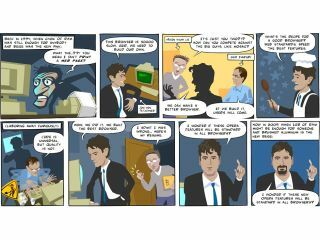 Opera has finally turned 15, and has decided to show off just what it has achieved in that decade and a half by creating a cartoon strip featuring its founders. While it's not as monumental as the Berlin Wall crumbling down or the Game Boy being released, it's still impressive to think the browser has managed to stay the course for 15 years, especially when the likes of Netscape have fallen by the wayside. "Geir [Ivarsøy, joint founder of Opera] and I knew the web would forever change how people live, work and play - the web browser would be the tool to enable that transformation," said Jon von Tetzchner, CEO, Opera. "Today, I am humbled by what our company, together with the worldwide community of Opera users, has achieved. In the next 15 years, billions of people will join the web. I am confident we will give them even more reasons to choose Opera. Everyone deserves a good browser, regardless of how or where they connect to the web." The company has since branched out into numerous other variations on the browser, including Mini and Mobile versions, as well as making use of the open nature of browser core to port it onto TVs, set-top boxes and the Wii. And Opera won't be stopping there, as it highlights in its back-slapping press release: "This year, Opera has already unveiled Opera Turbo, which compresses pages to give broadband-like speeds on almost any Internet connection. Yet there is much more to come. Stay tuned to see how we think the web will evolve next." While the big names of Firefox, Safari and Internet Explorer continue to dominate in terms of percentage of users, Opera has still managed to stay the course well, and if there's innovation coming then we always want to see more of it.